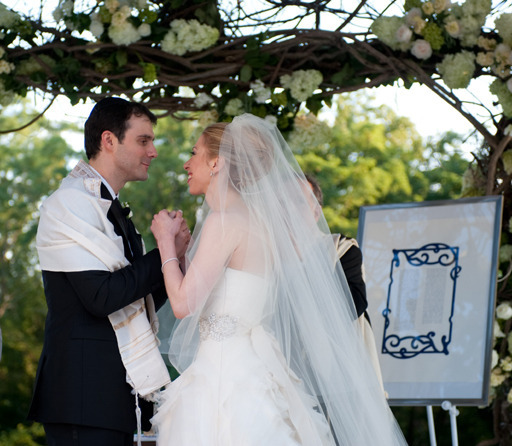 This week, Chelsea Clinton was married under a chupah, during Shabbat, to a Jew, Marc Mezvinsky. That Bill and Hillary Clinton’s daughter married a Jew has thrilled many Jews craving acceptance as further proof that American Jews have “made it.” That this intermarriage was adorned with some ritualistic Jewish touches has appalled many Jews defending tradition as further proof that American Jews have diluted Judaism, making it Jew-ish, a more digestible Judaism-lite. I am surprised either camp is surprised. North America is defined by its vastness. Whenever I travel around America, I am struck by the expanse that defines the New World. Irving Berlin was not just whistling Dixie when he praised America’s spacious skies. By contrast, Israel is defined by its density. First time pilgrims and veteran Israelis are equally impressed by all the history, humanity, and hysteria often packed into every square kilometer. Israel’s greatest national songwriter Naomi Shemer got it right when she channeled the great medieval poet Yehudah HaLevi in “Yerushalayim Shel Zahav” by writing “for ALL of your songs I am your violin” (or lute) – lechol shiriech ani kinor. Especially in Jerusalem, it seems that every stone has multiple stories, nothing is simple; everything is multilayered, multidimensional. Parked in a land so vast and free, American Jewry has developed a culture of expansiveness. American Jewry is justly celebrated for its openness, to others and to new ideas. The creativity and accessibility make American Jewry hip, dynamic, and welcoming. Most American Jews seem to shout out “Shalom Aleichem,” or “y’all come on in,” to fresh initiatives for achieving gender equality, to liturgical updating, to new rituals, to syntheses with modern culture, to new bridges beckoning to those who show interest in Judaism, regardless of their halachic legal status. Alas, the vastness also leads to porousness, the creativity flirts with superficiality, constantly being demeaned by trendiness. Judaism, traditionally defined as the Etz Haim, the solid, steadfast Tree of Life, risks becoming a will o’ the wisp. Living in the land of possibility, existing in a state of mobility, blessed by so much space, Americans and American Jews often view identity as malleable, relationships as disposable, change as the only constant. With surveys showing that American Jews are among the most cosmopolitan Americans, this next generation of American Jews is particularly wired to roam intellectually, ideologically, spiritually, existentially. And in the age of prolonged adolescence, all this searching, all this pondering, all this comparing and contrasting, sifting and synthesizing, can persist for decades. This approach treats Tzur Yisrael, the Rock of Israel, as unyielding, unchanging, stone-like in its reliability and impermeability. It risks being unwelcoming, unaccommodating, unresponsive, unable to adjust, paralyzed when facing great change. It makes Jewish education less about the American-style exploration and process but more of a knowledge-transfer. It sets Judaism in opposition to the modern world, come hell or high water, for better or worse. These general characteristics were on display during the recent conversion controversy. The Israeli Jewish establishment appeared particularly foreboding, hidebound, medieval, insensitive both to the Russian Jews who are Israeli cititzens but are not halachically, legally, Jewish and to the sensibilities of American Jews who value klal yisrael, the unity of the Jewish people. At the same time, too many American Jewish leaders approached the problem emotionally, even demagogically. Many railed about “Israel” delegitimizing them, Israel invalidating all American conversions, when no law passed, no such sweeping move even was proposed, and, beyond all the politicking, a complex problem needed solving. Judaism has survived all these years by having clearly defined boundaries, making it clear who is and is not a Jew. But Judaism has thrived all these years by being humane, by improvising solutions to new, unanticipated problems. The original idea behind the David Rotem conversion bill of empowering municipal rabbis to manage conversions would have brought more lenient rabbis into a broken, unduly strict process. Tragically, ugly coalition politics produced a proposed bill that would have formalized and centralized conversion power in the Chief Rabbinate, despite its terrible track record of not being sufficiently welcoming to aspiring Jews. However, the headline among North American Jews should be that their voices were heard, leaders like Natan Sharansky stood tall for Jewish unity. And Prime Minister Benjamin Netanyahu most recently vowed to kill the bill. More broadly, day by day, week after week, we see too many pockets of American Jewry that are vapid and need deeper rooting along with too many expressions of Israeli Jewry that are too dense and need some reforming. Israelis could use some of the North American vastness – not only for breathing room but to facilitate the kind of change that perpetually renewed Judaism as it evolved from Abraham to Abraham Joshua Heschel. And American Jews, in many realms, desperately needs more density, more depth, more anchoring. So, yes, Chelsea Clinton will find whatever American Judaism her husband exposes her to far more user friendly than most modern Israeli varieties. But whether it has the depth to grab either of them remains unclear, just as whether their yuppie peers will ever feel welcomed by Israeli-style Judaism remains equally unclear.